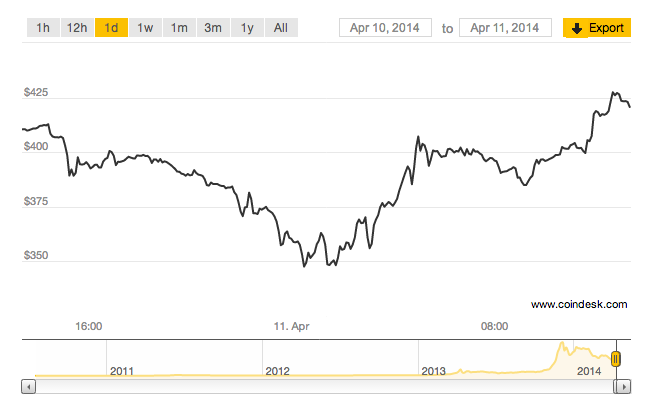 The price of bitcoin recovered from a low of roughly $380 and rose past $420 at press time on 11th April, on the news that Zhou Xiaochuan, the governor of the People’s Bank of China (PBOC), had issued new statements potentially clarifying the central bank’s position on bitcoin. According to reports, during Boao Forum, Xiaochuan offered his opinion on the nascent technology, saying that China would not seek to ban bitcoin and other digital currencies entirely. Xiaochuan continued his statements, offering a potential new potential classification for bitcoin, and suggesting that the PBOC may be actively considering how to treat bitcoin. Boao Forum is a regional economic conference that seeks to address economic problems in Asia, and to promote collaboration on solutions. At press time, the price of bitcoin on the CoinDesk USD Bitcoin Price Index (BPI) rose sharply on the news, climbing more than 18% to pass $420. Likewise, the price of bitcoin on the CoinDesk CNY BPI was up 12.9% at press time to reach ¥2630.70, up from the day’s open of ¥2,329.99. News of the statement first surfaced at roughly 7:00 GMT, with the publication of a report by China Securities Network, a news outlet that provides real-time financial reporting, and later resurfaced on a number of similar news channels. Though the remark may simply amount to an informal statement, it seemingly dispels fears percolating since March that China would potentially seek to ban bitcoin altogether. Though, the PBOC is still likely looking to step up enforcement of past rules aimed at separating domestic banks from the alleged risk posed by the nascent digital currency industry. In recent weeks, the price of bitcoin has dropped rapidly, from above $500 to below $400, on the news that China would seek to freeze the ability of major exchanges to conduct yuan deposits. Major exchanges have begun receiving notifications of account closures, and at present, Xiaochuan’s statements do not suggest a change in this policy. 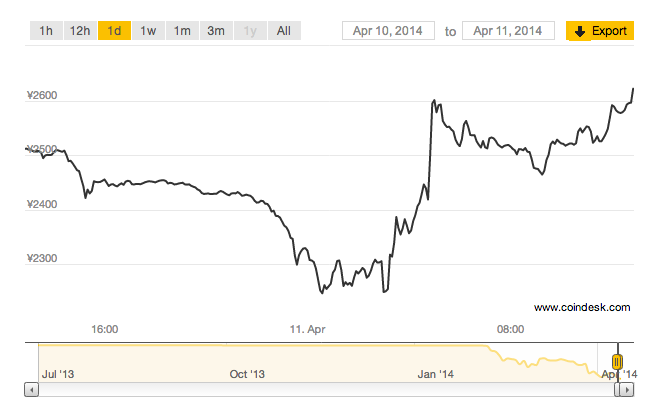 CoinDesk is continuing to monitor this developing story.